Accused of hit and run in Washington State? Call us - We can help! Accused of hit and run in Washington State? Learn more about Washington hit & run cases at HitandRunWashington.com. We created HitandRunWashington.com to answer all your questions about Washington state hit and run crimes. We did this because the law is intricate and confusing and we wanted to give you access to the information you need to deal with your pending hit and run case and to help you hire the best lawyer for your case. What is hit and run. Different levels of hit and run related charges. Potential penalties for a hit and run conviction. What you can do to help defend your hit and run case. If you are reading this posting, you or someone you know is probably in a tough spot. After having Patricia as my own legal council, I wholeheartedly recommend this individual on a professional and personal level. Patricia and her team were everything I’d hope for in a law office; thorough, well-respected, and compassionate. I sincerely appreciate all their efforts and wish them the best in all their future endeavors. Thank you. If you have been charged in Washington state with a hit and run crime, you need an experienced and professional lawyer to protect your rights and get you the best possible outcome for your case. We have handled hundreds of criminal charges, including many hit and run related cases. Together they have over 30 years of experience and have appeared in courts all over Washington state. 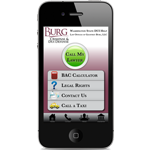 Most of our cases are in King, Snohomish, and Pierce counties. Geoff was "the best working lawyer I've ever had." Geoff helped me out so much.